The solar was a room in many English and French medieval manor houses, great houses and castles, generally situated on an upper storey, designed as the family's private living and sleeping quarters. Within castles they are often called the 'Lords' and 'Ladies Chamber', or the 'Great Chamber'. 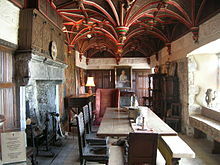 In some houses, the main ground-floor room was known as the Great Hall, in which all members of the household, including tenants, employees and servants, would eat. Those of highest status would be at the end, often on a raised dais, and those of lesser status further down the hall. But a need was felt for more privacy to be enjoyed by the head of the household, and, especially, by the senior women of the household. The solar was a room for their particular benefit, in which they could be alone and away from the hustle, bustle, noise and smells (including cooking smells) of the Great Hall. The solar was generally smaller than the Great Hall, because it was not expected to accommodate so many people, but it was a room of comfort and status, and usually included a fireplace and often decorative woodwork or tapestries/wall hangings. In the medieval house of Great Dixter, in East Sussex, it consists of 3 rooms and a fireplace from the late 15th century. In Windsor Castle, the walls are painted green with gold stars. In manor houses of Normandy and northern France, the solar was sometimes a separate tower or pavilion, away from the ground-floor hall (great hall) to provide more privacy to the lord and his family. This was also used later on castles built in the UK, such as Broughton Castle, in Oxfordshire, and Stokesay Castle in Shropshire. The possibly related term grianán (from Irish grian, "the sun"; often anglicised as "greenawn") was used in medieval Ireland for a sunny parlour or reception room. By extension it was used to refer to any summer palace or noble house. Beverston Castle near Tetbury in England, dating from the 13th century, has a surviving but ruined solar in the south tower of the west range, with a vaulted undercroft below. Edlingham Castle in Northumberland, castle in ruins but Solar tower is mostly intact. Great Dixter, in Northiam, East Sussex. Which is the home of the late British gardener and author Christopher Lloyd, has a recreated solar. Longthorpe Tower, Peterborough an extension to an existing fortified manor house. Tattershall Castle, Lincolnshire, has hall and large solar block later converted into a tower. ^ a b c "Solar". ancientfortresses.org. Retrieved 20 August 2017. ^ a b "Solar". greatdixter.co.uk. Retrieved 20 August 2017.